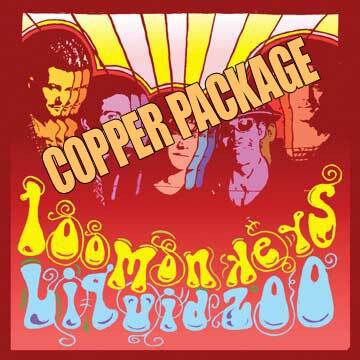 With the Copper Package, a copy of the "Liquid Zoo" CD will be mailed out to you and in your emailed receipt you will receive a link to download a copy (mp3s) of the entire album. With the Liquid Zoo Silver Package, you will receive a copy of the "Liquid Zoo" CD autographed by all members of 100 Monkeys. 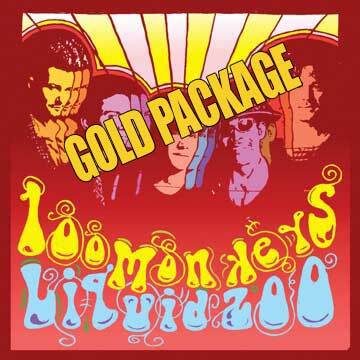 With the Liquid Zoo Gold Package, you will be mailed a copy of the "Liquid Zoo" CD autographed by all members of 100 Monkeys and in your emailed receipt you will receive a link to download a copy (mp3s) of the entire album. 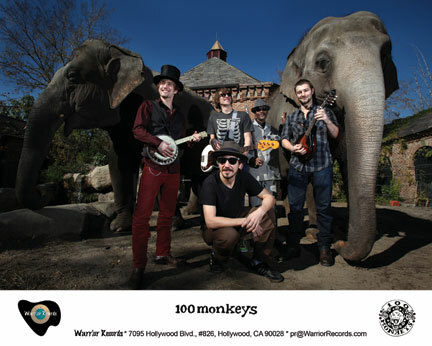 100 Monkeys have escaped from the Zoo...the Liquid Zoo and are inhabiting Warrior Records! 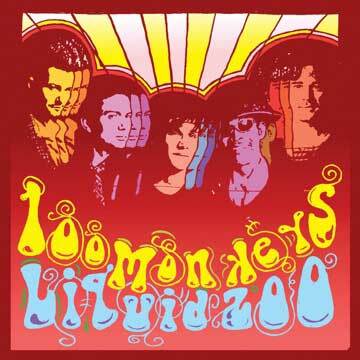 100 Monkeys, known for their raucous theatrical live-sets where they switch instruments and vocalists nearly every other song, have released the band's second studio album entitled, "Liquid Zoo" (a Top 50 iTunes Rock Album). 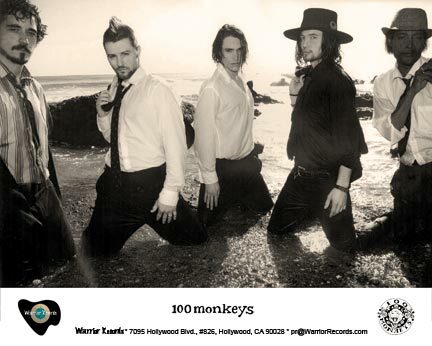 The band struck a deal with Warrior Records to release their music to the masses and 100 Monkeys' fans know that it has been well worth the wait. 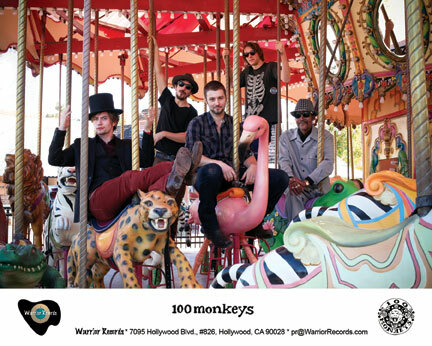 Coinciding with the "Liquid Zoo" album release, 100 Monkeys kicked off their 45+ city U.S. tour in conjunction with House of Blues Entertainment and LG. The tour opened in Cincinnati and includes dates in Dallas, Anaheim, Detroit, Chicago, San Francisco and other major cities. The band which has also been selected as one of LG's "One's To Watch" this summer are more than excited about the upcoming tour and album. They promise the biggest and best tour yet and of course the usual surprises along the way that only 100 Monkeys can deliver. The band is more than eager to get back to what they love...playing for their fans. 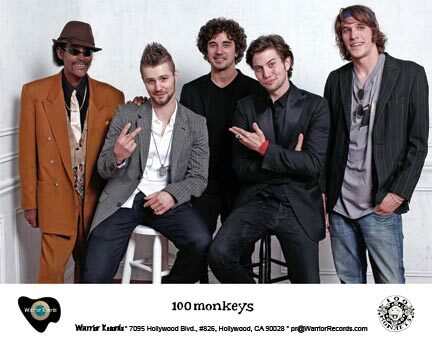 "100 Monkeys is an innovative, exciting young band and we are looking forward to working with them," said Tara Traub, Club and Theater Touring, House of Blues Entertainment. "This is part of our continuing commitment showcasing emerging artists and their music in the unique House of Blues environment." With a unique sound all their own, "Liquid Zoo" delivers innovative music in a way that only 100 Monkeys can. The album consists of 11 songs including the highly requested, "Shy Water," and "Black Diamond," which are among the solid track listing, along with at least one new song that the band has never performed live in any form. "Wandering Mind," the first single released off the "Liquid Zoo" album has already started to play on radio stations across the country. 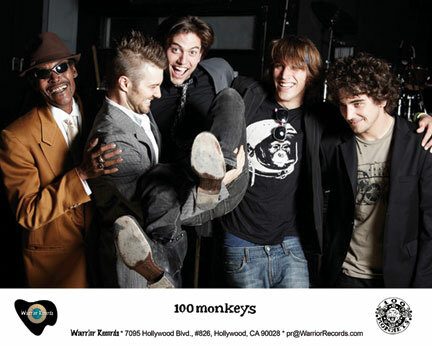 100 Monkeys is a band described by SPIN.com as "funk rock" and by RollingStone.com as "tribal sounds with vocals recalling Jim Morrison's baritone croon." Beyond Race Magazine says they are "sing-along-worthy, sometimes bluesy" and MTV.com describes the band as a mix of "Iggy Pop with the Raconteurs." 100 Monkeys, however, jest that their music is purely "onomatopoetic, but for the sake of simplicity, we'll call it funky rock-n-roll." This quintet of multi-instrumentalists is comprised of multi-faceted artists, actors, and producers including Jackson Rathbone (who appears in such movies as "The Last Airbender" and the "Twilight" motion picture franchise), Ben Graupner (Trapped in the 5150, Devolved), Jerad Anderson (Wayne/Lauren Film Company), Lawrence Abrams (of the great Willie Bobo, Bob Hope U.S.O. tour, and The Artist Consortium), and Ben Johnson (of the Stevedores and music producer of Spencer Bell's "Brain"). With a set list that never repeats twice, they are a band that truly knows how to put on their own rock show.